February 8, 2019 by Robert Ortiz-Abreu, Jr. The next LTG Timothy J. Maude Leadership Lecture Series will be held at the Robert B. Solomon Center, 6510 Strom Thurmond Blvd, Fort Jackson, SC on 5 March 2019 at 2:00 PM. The event is free to the general public. BG Thomas J. “T.J.” Edwards Jr., Chief, U.S. Army General Officer Management Office, will be the guest speaker. BG Edwards’ bio is provided below. BG Thomas J. “T.J.” Edwards Jr. is currently the 16th Chief, General Officer Management Office (GOMO). He was selected to lead GOMO in 2015 by GEN Mark A. Milley, the 39th Chief of Staff of the Army (CSA). BG Edwards’ initial Army tour was as an Executive Officer for the 69th Personnel Services Company, in Karlsruhe, Germany. From 1993 to 1996, BG Edwards commanded two separate Batteries at Fort Sill, OK. 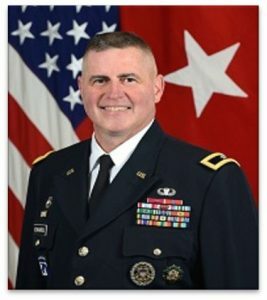 He next served in the 3rd Infantry Division until 1998 as Chief, Enlisted Strength Manager, and later as Chief, Officer Strength Manager at Fort Stewart, GA. From 1998 to 2000 he served as an Assignments Officer at the U.S. Army Human Resources Command (HRC), then based in Alexandria, VA. In 2000, BG Edwards was selected as a Joint Chiefs of Staff (JCS) Intern, where he served on the Joint Staff’s J-1, and later served as a Special Assistant to GEN Eric K. Shinseki, then serving as the Army’s 34th CSA. BG Edwards was at the Pentagon on 9-11, and later helped reconstitute the Army’s G-1 after the terrorist attack. From 2003 to 2004, BG Edwards served as the 82nd Airborne Division’s Deputy Adjutant General. In 2004, BG Edwards served as the XVIII Airborne Corps Strength Manager, and later deployed in support of Operation Iraqi Freedom from 2005 to 2006. From 2006 to 2008, BG Edwards served a second tour at the Pentagon, working in Army GOMO as the Operations Officer. From 2008 to 2011, BG Edwards commanded the 9th Battalion, U.S. Military Entrance Processing Command, with stations in Dallas, Houston, San Antonio, Amarillo, and El Paso, TX. After attending the Army War College, BG Edwards deployed to Kuwait as Third Army / U.S. Army Central’s G-1 (Lucky 1). Following his G-1 duties, BG Edwards commanded the U.S. Army Garrison at Fort Knox, KY from 2013 to 2015. In 2015, BG Edwards returned to the Pentagon upon selection as the Army G-1’s Executive Officer, but was subsequently selected by the CSA to serve as the Chief, GOMO. BG Edwards is a 1991 Distinguished Military Graduate from the University of South Carolina. He holds a Master of Arts in Communication from the University of Oklahoma; a Master of Arts in National Security and Strategic Studies from the U.S. Naval War College; and a Master of Science in Strategic Studies from the U.S. Army War College. With over two decades of service to the U.S. Army, BG Edwards’ awards include the Legion of Merit (two awards), the Bronze Star Medal, the Defense Meritorious Service Medal, the Meritorious Service Medal (five awards) and other decorations and awards.